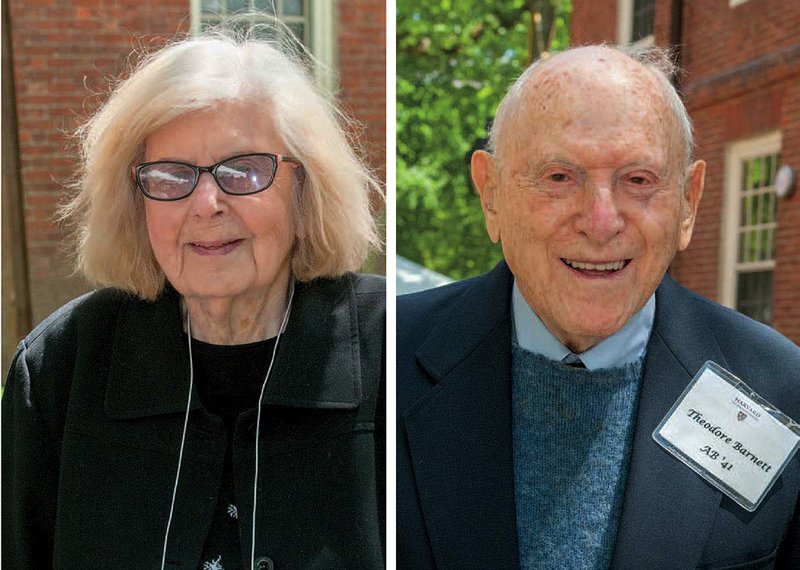 Evelyn Richmond ’41, of Nashville, Tennessee, and Theodore R. Barnett ’41, of Stowe, Vermont, were the oldest Radcliffe and Harvard alumni present on Commencement Day. For Richmond, 97, it was a distinction she also enjoyed three years ago (see July-August 2015 , page 75). She was again accompanied by her son, Clifford Richmond ’75; they have returned for Commencement week in recent years, including for her seventy-fifth reunion in 2016. Barnett, who turns 98 in August, was flanked by his wife, Monique Stirling, and a daughter, Susan Barnett ’82. He’s returned for many reunions while leading a life of various professional and personal pursuits. A retired county prosecutor, he has delved into land development, the Enneagram of Personality, and graphology. After Harvard, he served in World War II, and then joined his family’s wool-imports company, learning Arabic to work with vendors in the Middle East. “I traveled in the places that are now extremely dangerous to be in, Aleppo and parts of Iraq, and some places that just aren’t there anymore,” he says. “I was very lucky to be able to do that.” The two alumni were publicly honored by Harvard Alumni Association president Susan Morris Novick ’85.